Since your little one will be taking quite a few naps at different times of the day, it's important that you can adjust how much light is filtering through. I have to say...I prefer a big beautiful window without any plantation shutters blocking your view, but let's face it, not all of us have those big beautiful windows to show off. This was the case in the latest nursery I designed. We opted to keep the plantation shutters and add drapes to create some height and finish off the windows. I was recently informed by my client that she loves the set up! With the shutter/drape combo, my client has complete control over how much light filters through. She loves that she can let a little bit of light in during the day so that her baby can tell the difference between day and night. And being able to block all light out with the shutters and drapes closed is nice at times as well. What I have found is that most everyone requires a glider, crib, changing table and some sort of storage for books and toys. It's really important that the glider is extra comfy since you will be spending a lot of time in it. Most of my clients prefer a gliding ottoman as well. As far as layout goes it really just depends on the room, but I try to leave as much floor space as possible for room to roll around and play with toys as they grow. I was finally able to have my latest nursery photographed from Project Del Norte. I love how fresh and airy this nursery feels. 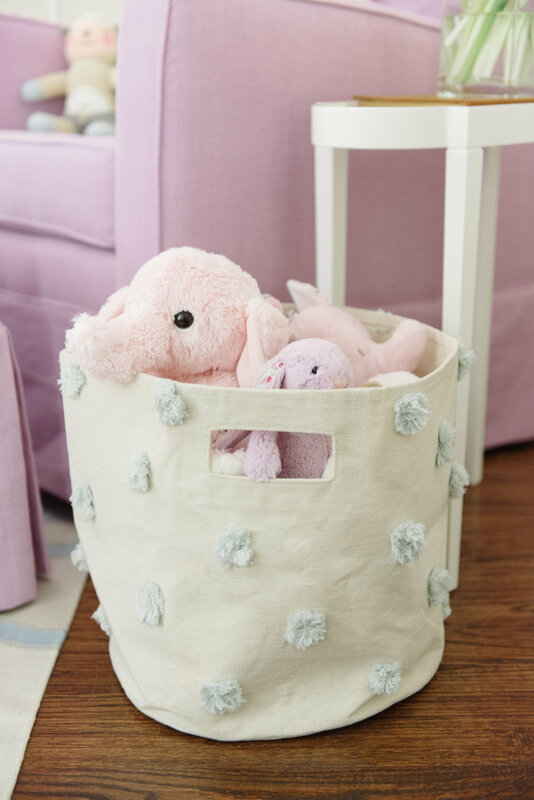 The soft colors make it so calming and peaceful, it's a perfect space for a perfect little girl.